Creating a Financial Model forces an entrepreneur to plan very specifically how their business will work, how users and customers find and use their products, and how those processes create revenues and costs. In addition, having a solid financial model is also a pre-requisite for raising your first round of startup funding. As tempting as it might be to outsource this project, it is important to create your own model in order to organize your thoughts, and quickly take action. Constructing your own model will help you predict potential obstacles, make calculated decisions, and see how the business will perform with a given set of assumptions. To help you get started, below is a step by step process to plan and build your company’s financial model, and start the revenue forecasting process. 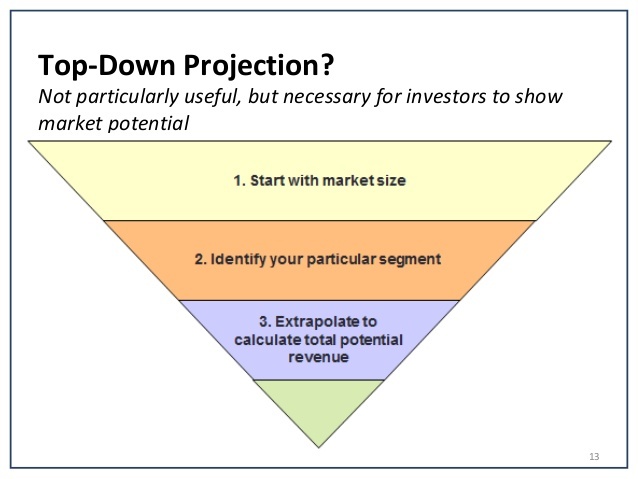 Creating a top-down model will require you to do some in-depth research on the market size, and other public metrics on your industry, in order to start your calculations. If your company has created an iPhone app, you might take a look at the number of consumers who have purchased apps for their iPhones. If there are 80M active iPhone users and half of iPhone users buy at least one app per month, you can extrapolate from here. Being conservative, you could estimate that of the 40M active iphone users who purchase apps, .2% of these consumers will purchase your app. That would give you 100K new customers. ARPU is defined as total revenue divided by the number of users for a specific time period, typically over a month, quarter, or year. This is a meaningful metric as it demonstrates the value of users on your platform, regardless of whether those users buy subscriptions (such as telecom monthly subscriptions) or click on ads as they consume content. For pre-revenue companies, investors will often compare the prospects of a company against the known ARPU for established companies. For example, Facebook generated $9.30 ARPU in FY2015Q2 from its U.S. and Canada users. Customer acquisition cost or CAC should be the full cost of acquiring users, stated on a per-user basis. Unfortunately, CAC metrics come in all shapes and sizes. One common problem with CAC metrics is failing to include all the costs incurred in user acquisition such as referral fees, credits, or discounts. Another common problem is to calculate CAC as a “blended” cost (including users acquired organically) rather than isolating users acquired through “paid” marketing. While "Blended CAC" [total acquisition cost / total new customers acquired across all channels] isn’t wrong, it doesn’t inform how well your paid campaigns are working and whether they’re profitable. This is why investors consider paid CAC [total acquisition cost/ new customers acquired through paid marketing] to be more important than blended CAC in evaluating the viability of a business — it informs whether a company can scale up its user acquisition budget profitably. A common mistake is to estimate the LTV as a present value of revenue or even gross margin of the customer instead of calculating it as the net profit of the customer over the life of the relationship. Avg. lifespan of the customer (in months) = 1 / by your monthly churn. LTV = Contribution margin from customer multiplied by the average lifespan of the customer. Note, if you have only a few months of data, the conservative way to measure LTV is to look at historical value to date. Rather than predicting average lifespan and estimating how the retention curves might look, we prefer to measure 12 month and 24 month LTV. Any good financial model lives and dies by assumptions. Create a separate assumptions tab and plan for them to change overtime. Create a bulk of assumptions, listing out revenue, loss, Cost of Goods Sold (COOGS), etc., all laid out and organized in clear formatting. Start thinking about your business and how it will pan out. How much are things going to cost? When are you going to have to pay this or that expense? Keep in mind that many of your assumptions will be wildly inaccurate, and that is okay. Many of your costs may even be less than forecasted! To give you an idea of how far off things can be, check out this article by the projected vs. actual numbers shared by Glenn Kelman (Founder of Redfin and FI Mentor) shared some of the projected versus actual numbers in the financial model from Redfin. Focusing most of your effort on projected headcount and salary is time well spent. According to Kelman,"outside of marketing programs, the basis for all cost in Internet software is headcount. Just figure out whom you’ll hire and how much you’ll pay and you can’t go far wrong." Always go high on estimated costs. For example, when estimating employee salary, find the average local wage for that role and multiply by at least 1.5X. Don't assume that you will become more efficient as you grow ("economies of scale"). According to Kelman, "The biggest whopper is that a business will magically become more efficient as it grows. If you really believe this, just walk into the headquarters of Amazon or eBay. Bureaucracies grow. Salaries float away. Straining to make a model work, I always forget that per-employee costs rise every year." Create several scenarios for revenue, including low, medium, and high estimates. According to Kelman, "if you don’t have any revenues yet, you can’t say what they’ll be. The point of a model is to prove you can make money if people buy your product, not to insist that they will. By developing different scenarios based on different levels of demand, you can later calibrate hiring and spending according to which scenario fits reality best." Models always start with a dashboard. When does your revenue cover your operations? What’s the zipcode or timecode that you will breakeven? Revenue per employee is calculated by dividing a firm's revenue by its total number of workers (Revenue/Number of Employees). Increase headcount and add this to your monthly expense. What will be the average revenue generated by each employee? How will you find a way to squeeze more sales (revenue) out of each employee? Rule of Thumb: Expenses per Employee is usually around $180-200k. Determine how much money you need to raise for your project. How much do you need to raise by when? When will you be at your low point? When do you estimate your high point? What’s the naked number you’re solving for? Target the number of users over a certain time span. Can you measure your company’s performance and future earning through a valuation metric? How will you prove the likely number of registered users and customer acquisition count? Rule of Thumb: Placing curves on your assumptions helps you back them up. Keep in mind that the definition for "active users" varies per business. For instance, Facebook defines “active” as a registered user who logged in and visited the site via any device, or as a user who took an action to share content or activity with Facebook friends via 3rd-party sites integrated with Facebook. The important things to remember when measuring your active users are to: (1) clearly define it; (2) make sure it’s a true representation of “activity” on your platform; and (3) be consistent in applying that definition. Social Sites: common metrics of measure for activity are MAUs (monthly active users), WAUs (weekly active users), DAUs (daily active users), and HAUs (hourly active users). Content Sites: a common measure of active users and activity on all kinds of content-based sites has been “uniques” (monthly unique visitors) and visits (pageviews or sometimes “sessions” is defined as a minimum period of complete activity). E-Commerce Sites: these businesses have a much more telling metric — revenue (and gross margin). You can see more examples on the A16Z blog. Creating a more advanced dashboard includes using formulas to converge your financial statements and assumptions. The three statements include your income statement, balance sheet, and cash flow statement, used to predict future finances going forward. All financial statements are linked together. In an advanced model this information can be in separate tabs or visible through one tab in excel, establishing a one-stop shop of information. This one tab can drive founder, mentor, or investor discussions. Listed below are the most improtant aspects of your model that will tie together. What will be your user growth rate month over month? Summarize by quarter and organize by low, medium, or high, month to month. Start at twenty percent, which is normal for a monthly user growth rate. Multiply 20% over the next 21 months. Input historical financial data on your income statements and balance sheets, then calculate ratios with your statements to establish gross margin, net income margin, accounts receivable/payable days, etc. 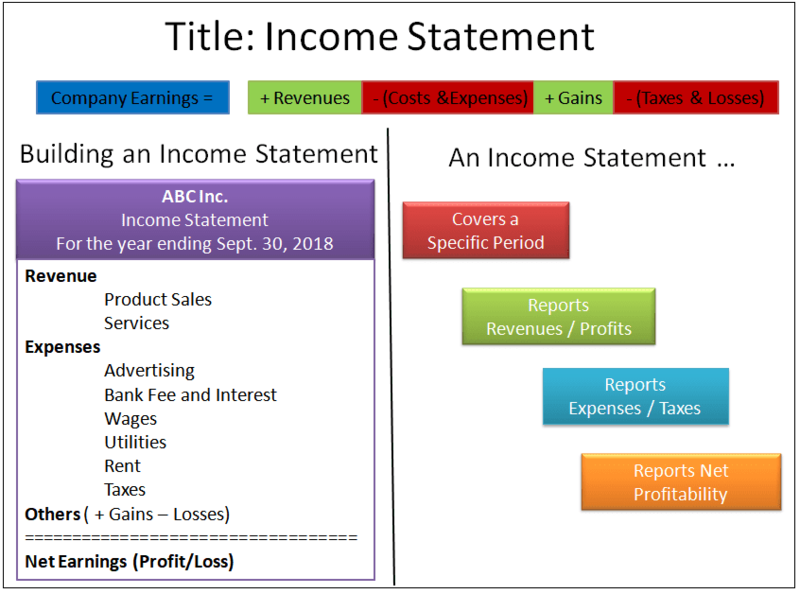 Income statements (also known as the Profit and Loss Statement) begins with an entry for revenue and subtracts from revenue, the costs of running the business. It will calculate: Year-over-year growth rates of revenue, growth profits, and net income. Margin and growth rate analysis will calculate Cost of Goods Sold (COGS) gross margin, Selling, General & Administrative (SG&A), effective tax rate, etc. Balance Statements summarize the company's assets and liabilities and follows this format: Assets = Liabilities + Shareholders' Equity. An example would be, “you want to pay your bills in 48 days, but you want your customers to pay you in 26 days.” This section will calculate: Accounts Receivable Days, prepaid expenses, Accounts Payable Days, etc. Make future assumptions for projecting the income and balance sheet based on these ratios, which will change overtime. Build a “Statement of Cashflows” by tying together the "net income from your income statement and cash from balance sheet." 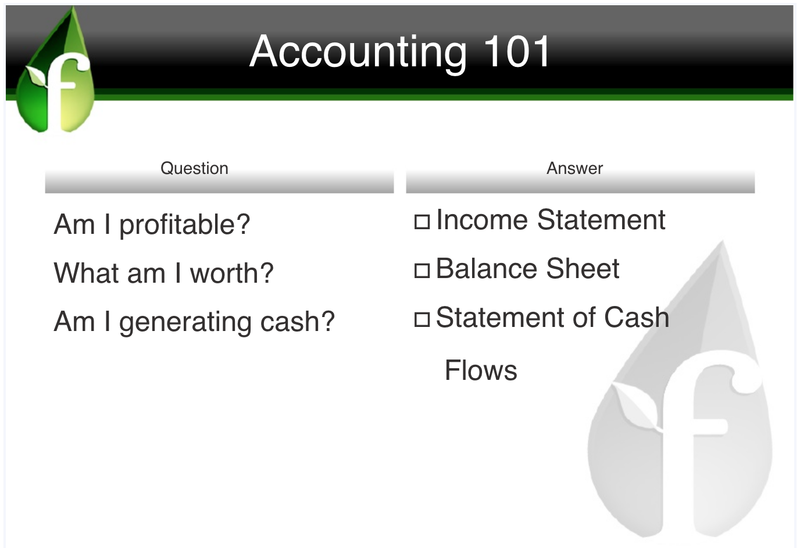 Once all checks are balanced, calculate interest expense and tie into income statement. The complexity doesn’t entirely set in until you use tricks to collapse your projects like spinner bottoms that are used to compare different outcomes/ revenue per monthly user. Get a more detailed explanation from the Three Statement Financial Modeling, from the Street of Walls. There are various templates for constructing your financial model, but this information sums up the basic elements. If you are willing to pay for the service, there are a bunch of software options to help you, like FinModelsLab, Foresight, StartupFinancialModel.com, LivePlan, and more. In the video below from the Denver Founder Institute, startup expert Jim Franklin (Former CEO of SendGrid and FI Mentor) explains many of the topics discussed above in greater detail. Get more insights from the world's leading entrepreneurs on Founder Insight Podcasts. The Founder Institute is the world’s premier pre-seed startup accelerator, with chapters across 180+ cities and Graduates that have built companies exceeding $20B in estimated value. In the Founder Institute, high-potential entrepreneurs and teams can get the critical support network and structured process needed to build an enduring company. Learn more at FI.co/overview, or apply to build a startup in the Washington DC Founder Institute today.